“Omigosh she really had a LARGE face,” I exclaim as Lily the donkey puts her face really close to mine, almost pushing me backwards. Even as I regain my balance and crouch on the grass, Blossom the goat comes charging toward me – only to place her head affectionately on my shoulder! This was truly unexpected, the gush of affection from a donkey and goats that I’d only just barely met. It was overwhelming. Soon many more goats came clustering around me, asking to be stroked or caressed. But as soon as Virani, the ‘goat lady’ plucked some lush green leaves off a tall plant and offered it to them, a mini ‘great migration’ happened, and all the hooves turned in the other direction. “They’re not hungry,” explains Virani, for after a few bites, they are content to just stand there. “They have plenty to eat on the land here, for we believe in sustainable feeding. And their babies are allowed to suckle and feed for as long as they want all day; we only milk them for what’s left over so it’s a humane system.” Virani runs the Yogoata Diary Farm here at Ananda Village, a community established by Swami Kriyananda in 1967-68 near Nevada City, California, as per the principles advocated by his guru Yogananda, spread over 900 acres and housing some 300 residents currently. How did Virani come to choose goat farming? “Well, the community needed goats’ milk and I thought, okay, why not give it a try, and I set about learning all that there was to learn about goats… went to classes, researched online and so on and here I am!” Virani says she loves what she does – very involved with her goats, she knows each of them by their name, and she names all those born in a particular year with a name beginning with the same alphabet for easy chronological identification. She currently has 18 goats and two donkeys. The he-goats “mow” the meadows even in inaccessible places and are protected by another donkey, Jenny. The she-goats graze all day and have babies and give milk. She-goat names range from Amanda, Asha, Blessed and Chela to Manzanita, Yurga, Yodeler and Zsa Zsa. The he-goats have names like Arjuna, Banana, Chaitanya, Curious and Carrot to Dazzle, Darshan and Zorro. Virani knows them all by name and the goats too respond when their names are called out. Virani became a devotee of Yogananda after reading his teachings and learning his kind of meditation. “The meditation helped me to gain confidence at work and the courage to do my duty as Deputy Sheriff. And now the same meditation gives me the confidence to deal with goats,” she says, even as she manoeuvres the little battery-operated vehicle that carts us around, that she normally uses for her work. In the movie, ‘Finding Happiness’ slated for release in movie halls across India on April 11, there’s a scene where a fictional journalist (played by Elisabeth Rohm) visits the Yogoata Farm at Ananda Village. Virani calls out and the goats come racing toward her, completely astonishing the journalist from New York City – who is perhaps only used to the rushing of vehicles on the motorway! The movie seeks to present the community and the way they live through the eyes of a sceptical journalist visiting there to do a story for a magazine. The 56 year-old Virani (“my spiritual name means ‘he one with great courage”) works 18 hours a day, mostly outdoors, with no pay — looks in great shape, is really strong and exudes happiness. Can one ask for more? ‘Finding Happiness’ is no easy task, but how about some cosmic croutons for starters? I’d never been to the West Coast of USA before. As soon as I landed in San Francisco on March 10 I remembered what I’d been told by seasoned visitors: “California is a country by itself!” And I had just read Philip Goldberg write in his new book, ‘Amercian Veda’ that from his home in Los Angeles, California, he only has to head out 20 minutes any which way and he would reach an ashram or centre inspired by an Indian spiritual guru as the radius has at least 20 different such organisations or visiting gurus. Well, I too was heading toward a spiritual community inspired by Yogananda’s teachings; the Ananda Village near Nevada City established by Swami Kriyananda and his team of devotees in 1968-69, adhering to the philosophy of an illustrious lineage of gurus: Mahavatar Babaji, Lahiri Mahasaya, Yukteshwar Giri, Yogananda and Kriyananda (earlier known as Donald Walters, a direct disciple of Yogananda who passed away last April). The visa officer at the US embassy did ask me quizzically why when everyone from America was headed to India to enrol in a yoga retreat, I chose to go in the opposite direction and do the same thing in California! After an overnight stay at their Palo Alto community in San Francisco and driving some four hours to Ananda Village, you come across another, even more different world than San Francisco. Spread over some 900 acres, its 300-odd residents all live in complete harmony, now led by Jyotish and Devi Novak, the couple who had been with Kriyananda from the early days of setting up the ashram here. Santoshi Nancy Kendall, Raja Yoga teacher, life purpose guide and workshop leader, a longtime resident of Ananda village and an accomplished fingerprint reader, drove me and another journalist colleague around the campus, pointing out various landmarks: Swamiji’s Crystal Cottage that now serves as community centre and venue for weddings and other parties and meetings; the permaculture farmland that is an experiment in sustainable agriculture; the goat farm where ducks and geese waddle around even as bearded goats stare into the distance; a community residential block where inmates share a common kitchen, living room and courtyard/ garden; the Ananda Living Wisdom School that seeks to not just give knowledge to children but help expand their consciousness; the Dental/ medical / behavioural health clinic; the car and other vehicles repair centre; the reception, mail room, Thrift Store and….. aaah, the Master’s Market. The Master’s Market is a grocery store where you can get almost everything from Chandrika ayurvedic soap, Sarsaparilla root beverage and green coconut drink to brown rice, kale leaves and sunflower seeds. But have you ever heard of Spirulina Green Bliss Balls or Cosmic Croutons? Well, they’re all made here, to health specifications, guaranteed to promote your well-being. And the croutons indeed taste heavenly… er, I mean, cosmic. I haven’t steeled myself yet to try the Bliss Balls but for sure I will, before I leave! 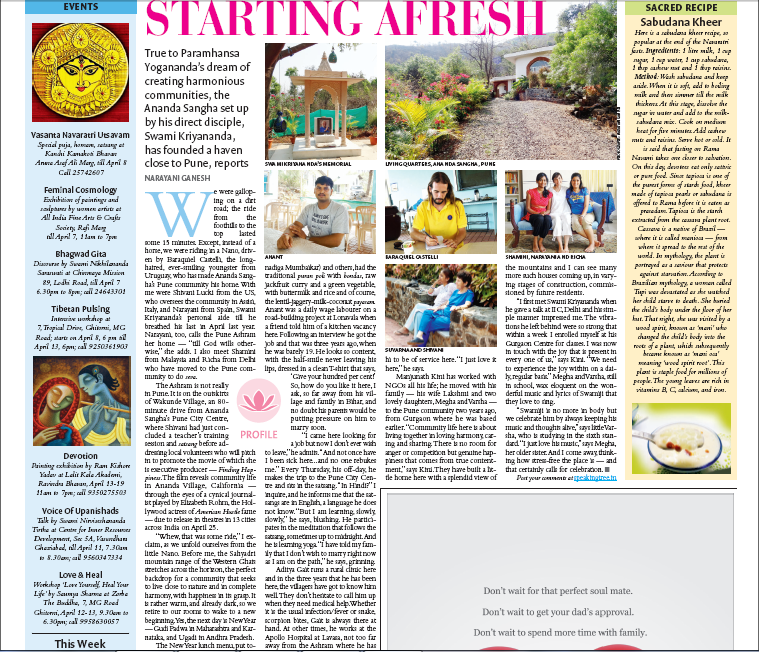 And there’s so much more to savour – classes on yoga postures, energisation and meditation, introduction to kriya yoga, a nature walk around the lake, class on Self-realisation, and….. a meeting with Elisabeth Rohm, the beautiful Hollywood actor who plays the mayor’s wife in ‘American Hustle’. ‘Finding Happiness’ is due to release simultaneously in 20 cinema halls across India on April 11 this year.